Neato! Anyone have any more info on this game? I've never heard of this company or game. I'm looking...but I've got zilch so far. There is another thread that Phantom bumped and Slapdash does describe this game. Here is what Slapdash says. I would dump the rom, post it on the internet, have a new cart made from that rom, and put the original cart in a safety deposit box. That way, the rom will not be lost and nobody knows what the original cart looks like to make copies. Wow, congrats Phantom it looks like you have a once in a ten lifetime find. So many questions. Is this an NTSC game? Was it made in America? This is going to be interesting. We have never had a one of a kind game land in the hands of a seller of Atari 2600 games before. Thanks for sharing and good luck. MAde in USA? Havent a frickin clue but assume it was made by gammation and if they were in the USA then yes. You call me a seller but maybe when you realize this isnt available for any cost, maybe then you will realize youre wrong. Well cool than keep it. Makes no difference to me. You do sell a lot so I guess I thought you were going to sell it. Be proud of what you have it's a cool item. I have a feeling though that this may not get dumped after all. If that is the case then it will end up like Good Luck Charlie Brown, Birthday Mania, Red Sea Crossing, and Pink Panther. Remember this though Phantom. There is a chance the cart could die on you and the info would be lost to the world forever. Everything I sell I have a double of so why should I keep a double? Heck i'll buy a game just for a better lable and then i have to recoup some from my original copy. I recently took a bit of a bath on games I resold because they are now doubles if you compare them to the singles prices I originally bought them at. I also do alot, and I mean alot of trading just go look at my lengthy recommended list. Edited by Phantom, Fri Jan 25, 2008 7:25 PM. Phantom, If you want to dump the game find out who is close to you that has a dumper. Several people on these boards do, but what state are you in? Then if you want to release the game decide how you want to do it. If you want to sell a few copies talk to Al and see what he says. Looking forward to hearing about the gameplay. I hope it turns out to be a good game rather than just another rare game that's a dud! I certainly can understand your excitement. I'd be beside myself with such a find, I can't even imagine. Have fun! Ok this is what Ive discovered thus far and I will try to say it as Im telling a story of the game I just played as that should be easier to follow along and not forget anything. It has 4 game slections 1-4.
what they do i dont really know but it seems to make it harder and faster. Weird thing is it plays out of port #2 only and is 1 player it appears. Maybe it uses both ports somehow as I can move in port 1 but cant shoot. You are the UFO shooting the tanks. You can go up and down and right and left. But it only shoots to the left at one continuous angle. It appears it keeps covering the same ground and never gets anywhere but i need to play it longer because either its real easy or real hard. It also could be a proto or they just left it at this stage and considered it done because it is playable but when you die, you are on the ground in a heap but the game continues on though you cant fire and the tanks bullets do not hit you they go through so I assume this is the end, atleast for now. You can move the heap but you just scroll along the same terrain. Never says GAME OVER. It definately gets harder as you go with more tanks and faster firing bullets. You startt out being able to move Up and down but as you get hit and crash to the ground, you drop a bit with each hit and you seem to never be able to regain your height once youve dropped unless theres more to the game than Ive discovered as of yet. needless to say a manual would be great to figure some of this stuff out. It appears you dont have lives only your range of motion is your lifeline so to speak. I need to try more and different things tomorrow and report on it more. It does seem to change levels but not visibly, more autmatically as it gets harder with each wave and you really cant tell where the wave ends but it kinda gets barren of tanks going right makes this occur more, like a safe zone of sorts, so I think you need to keep going left but you can tell another wave arrived as it gets harder and more tanks appear yet it doesnt say wave 2, wave 3 etc like Stargate. I hope this helps all who are curious and its the best I can do for now. I dont think i forgot anything but if I have i will surely edit this post. Thanks to everyone who said congrats and I want to personally send my congrats to headfamily as he is a new Papi today . Here's to 2 great discoveries on this fine day. They should name the child Gamma IMO, lol. Seriously, Congrats to your entire family for this blessing Kev. Edited by Phantom, Fri Jan 25, 2008 9:14 PM. Thanks for the gameplay report! What are the sounds like? Do they sound familiar, like from any other 2600 game? By the looks of the cart, that's a strong possibility. It doesnt really play like anything Ive ever played. Thats the best thing about it thus far. Im hoping there is more to the game and damn I wish someone had some kinda manual as you would think it was sold originally with some manual no matter how small. Edited by Phantom, Fri Jan 25, 2008 9:37 PM. If it's a proto (which I think it may be), there may never have been a manual. Just because the game was advertised doesn't mean it was actually released. I guess we'll find out (hopefully). did you find this at a thrift store? congratulations, you're living the game collector dream. Edited by Phantom, Fri Jan 25, 2008 9:53 PM. Just a thought here, but you may want to try a different controller in port 1. GI Joe: Cobra Strike for the 2600 uses paddles in port 1 and a joystick in port 2, so one player controls the Cobra and the other the Joe's guns. Much congrats on your find, Phantom. I know you must be quite proud of it. I know I would be if I came across something like that. I don't really have much to throw on the table. 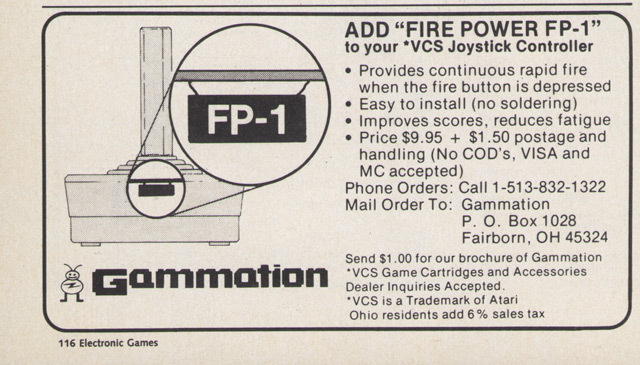 Except for the game operating on joystick port 2 might just be the way the game was programmed to work. After all, Towering Inferno does this. Good point. I havent played that game in ages but I will definatley be comparing it tomorrow to this one. Now Im sleepy enough to sleep so to the sandman I now go. Cheers! What A Day! I know I will never forget it and is why this original cart wont be for sale at any price. Sweet Dreams..
Edited by Phantom, Sat Jan 26, 2008 7:08 PM. Thanks for the description, Phantom. BTW: does the background scroll or is it static? Also, is there a model number on the cart? Edited by Rom Hunter, Sat Jan 26, 2008 2:54 AM. Using the information in that ad, I was able to locate the person responsible for Gammation. Unfortunately, he's long dead...he died in 1993. I have to agree with what has been mentioned before. Find someone near you with a cart-dumper and back that thing up. It's too rare to let just die as it will eventually, without even a copy of the code. I hope you enjoy it, and that a few dupes can be made(with different labels, of course). This kinda stuff never happens to me, so I'm happy for you!